A shallow patch of the North Sea is the site of an intriguing plan to reduce the cost and complexity of offshore wind farms. Announced in March 2017, the plan calls for the construction of an artificial island to form the hub of a massive network of wind turbines. 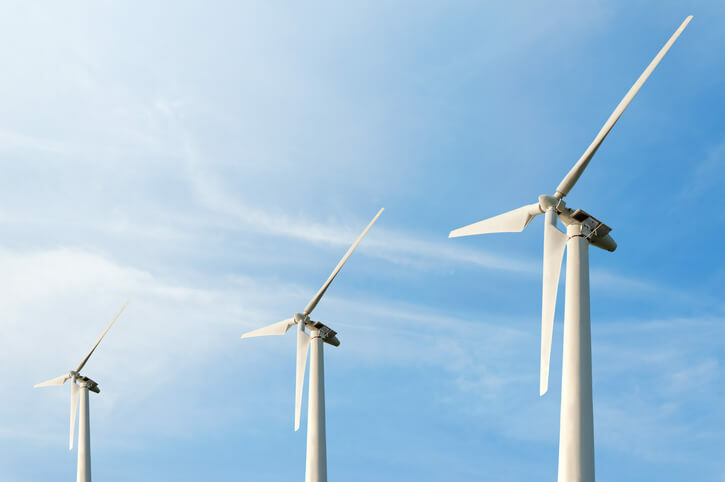 One key advantage of a hub is that it shortens the distance between the wind turbines and land — slashing cabling costs and reducing the risk of cable damage. The hub would then distribute the electricity to mainland power grids. European power companies based in Denmark, Germany, and the Netherlands signed an agreement to launch a feasibility study for constructing the North Sea Wind Power Hub on Dogger Bank, which is just over 60 miles east of England’s coastline. Media reports estimated the cost at around $2 billion and suggested it could go into development between 2030 and 2050. The current proposal calls for an artificial island of about 2.5 square miles with an airport, harbor, homes for staff and solar panels. Multiple wind farms could feed into the island hub, which would use direct-current cables to transmit energy to the mainland. The developers say the project could capture up to 100,000 megawatts of power and serve up to 80 million people in Europe. The hub also could be a vital connection point in the energy markets of Northern Europe. The developers are transmission system operators TenneT B.V. of the Netherlands, Energinet.dk of Denmark and TenneT GmbH of Germany. They signed an agreement in Brussels to work together on the Wind Power Hub project. The North Sea’s Dogger Bank is much shallower than its surrounding waters, making it an ideal location for wind farm development. Water depths range from 50 to 120 feet in the bank, which stretches across 6,800 square miles. Dogger Bank is in the middle of a section of the North Sea bounded by England, Belgium, the Netherlands, Germany, Denmark, and Norway. The bank also is a well-known fishing area, supplying cod and herring to European markets. Shallow waters and strong winds make Dogger Bank an attractive candidate for an offshore wind farm. But the project’s effects on major fisheries could be one of the major wrinkles to emerge in the feasibility study. China’s construction of artificial islands in the South China Sea is one of the most high-profile examples of the engineering prowess required to enable these kinds of projects. Though the islands may unnerve neighboring nations, they do establish the feasibility of building artificial islands in open seas. As a wind farm hub, an artificial island provides a central location for ships, planes, personnel and other resources that would have to cross much larger distances from the mainland, piling costs onto already expensive projects. The ultimate goal of the North Sea Power Hub is to centralize and standardize the far-flung operations of multiple wind farms. This creates economies of scale that make offshore wind much more practical. Of course, significant challenges must be worked out. Building an island in the middle of an active fishery is bound to bring scrutiny from regulators and the fisheries industry — though at first glance it appears the island would be a mere speck in comparison to the overall size of Dogger Bank. Wind energy is clean and sustainable, and open-ocean has the strongest winds. These twin forces make offshore wind one of Europe’s best candidates for meeting its ambitious goal of shrinking greenhouse gas emissions by 80 percent (from 1990 levels) over the next 30 years. That’s all the more reason to cheer the emergence of innovative offshore wind projects like the one proposed in Dogger Bank.